I think we’re all just about ready to close the door on winter and welcome Spring with open arms. There are signs all around us that Spring’s arrival is imminent. We moved the clocks ahead today, the temperatures have risen to above freezing, birds are chirping and if the wind is blowing right, you can catch a whiff of the earth’s aroma sneaking out from beneath all those layers of snow. With the changing of the seasons also comes a motivation for Spring cleaning and nothing is exempt – especially the fridge. 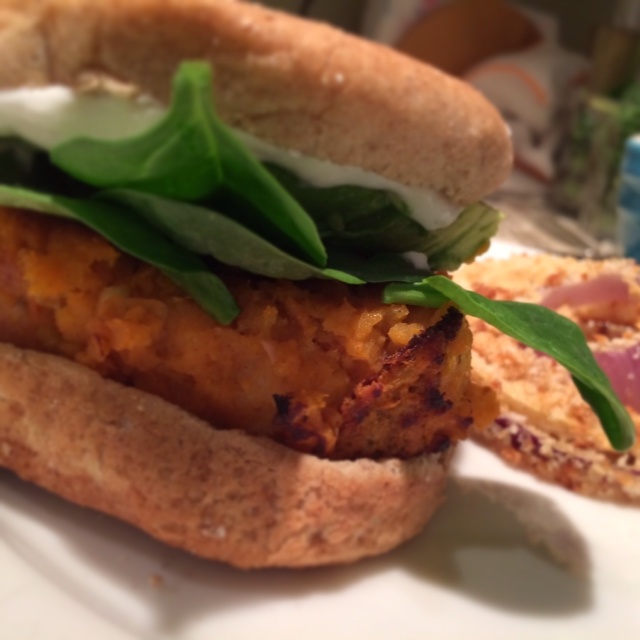 We have quite a few odds and ends ingredients that have been taking up residence for too long, so after doing an assessment, I determined that sweet potato burgers and baked onion rings would be the best thing to make today. I’ve made this dish a couple times before, and in the interest of using only what we have, I’m making a few adjustments to the ingredients today. I’m also excited to try a new recipe for baked onion rings. I have half of one red and white onion, so I think they’ll work just fine. That recipe is over here. In a large bowl, coarsely mash beans with a fork. Add in sweet potato and mash together, then add in pumpkin, sriracha, spices, salt and pepper, minced garlic, egg, panko and flour. Mix together until combined, then place bowl in the fridge for 15-20 minutes. This helps form them into patties, but as a warning they are still somewhat messy. This step can be done a few hours ahead of time. While mixture is chilling, combine yogurt/sour cream with 2 bulbs (squeezed out) of roasted garlic cloves, maple syrup and a sprinkle of salt and pepper in a blender or food processor. Process until smooth then set aside until ready to use. Heat a large skillet over medium heat and add 2 tablespoons olive oil. Remove mixture from fridge and form into 4 equal patties, then place in the skillet once hot. Since the mixture can be wet and messy, do not move until they are fully cooked and golden on one side. This takes about 5-6 minutes. Then, add more oil if needed (this really helps cook them) and flip burgers very gently. Cook for another 5-6 minutes. Toast buns if desired. Assemble by topping burgers with roasted garlic cream and avocado. wow! i love this burger! I also posted about the best burger i’ve tried “The burger project” , check it out on my blog post!